There are multiple cancer-fighting benefits of beets. Beets contain high levels of antioxidant and anti-inflammatory agents that studies show may help reduce the risk of some cancers. (Here are some other antioxidant-rich foods you should be eating.) They get their striking red color from betacyanin, a plant pigment that some preliminary research indicates might help defend cells against harmful carcinogens. Also, high levels of a unique fiber found in beets may be linked to a lower colon cancer risk. Dr. Mehmet Oz has said on sharecare.com that adding a quarter cup of beets to your daily diet could cut your kidney cancer risk. Here are some more foods that can help fight different types of cancer. 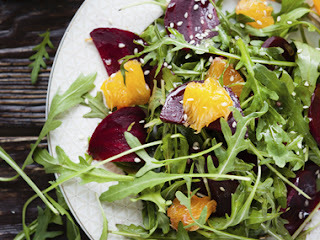 Beets are a good source of folate and betaine. (Check out these other foods that are high in folate.) These nutrients act together to help lower blood levels of homocysteine, which can increase your risk of heart disease by causing artery-damaging inflammation. British researchers conducted studies that found athletes who drank beet juice mixed with a little apple juice before working out reported better endurance and a lower resting blood pressure than those who did not. (Here are 7 other foods that lower blood pressure.) The performance boost is thought to be from the nitrates found in the root. And these aren't the only energy-boosting benefits of beets. Additional research suggests that a beet-apple juice mixture could make certain activities (like walking) less exhausting for seniors. Fiber helps keep your digestive system running smoothly, and one of the many benefits of beets is that they are chock full of it. Here are some ways to get more fiber into your diet without even trying, and here are some other superfoods you should definitely add to your diet this fall. Beets are high in oxalate, which can contribute to gout, a type of arthritis that develops when too much uric acid builds up in the body. Make sure you avoid these eight foods if you have arthritis.